I made a mini Taung Child! I've been playing around with my job's new 3D printer because I'm supposed to do a write up on what it is for students and professors despite the fact that I've only started using it on Saturday and I've only used it twice. 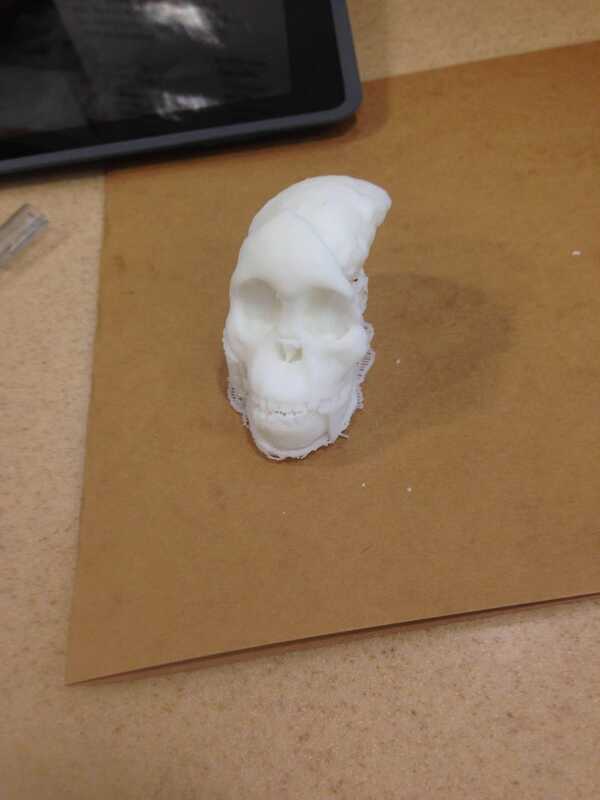 RadioLab did a short on the Taung Child two weeks ago and they mentioned that they had scanned the skull so they could create a "thing" that you could download from their Thingiverse - a website where people upload their creations and you can download them and print them out yourself. It's not completely finished - part of the printing process includes printing support stuff to keep your object in place while it's printing and you just remove them with a x-acto knife or something. I'm already staying a bit late to make sure it printed and I could put everything away. Not suuuper eager to stay longer to carefully remove tiny bits of plastic. Cool, no?